Hi All. My Hornet, re-named 'GONK' has started to show a few signs of tiredness in the short time since I've had it. I decided to have the roof swapped for a new one from M-Machine to get rid of the awful 80's Glass sunroof. I didn't know about this forum, so I didn't take any pictures, but on the way over to the fabrication shop to have the deed done, the engine temp rose, the oil pressure went down from 60 to 5psi, and I realized that surgery was probably on the cards! It also leaks oil at an alarming rate, so it's going to have to come out. As I'm short of time to pull the engine, and a quick look on a ramp showed that a few bits of welding & other work was going to be required for the MOT in May, I decided to look for another engine to re-build & do the swap later. 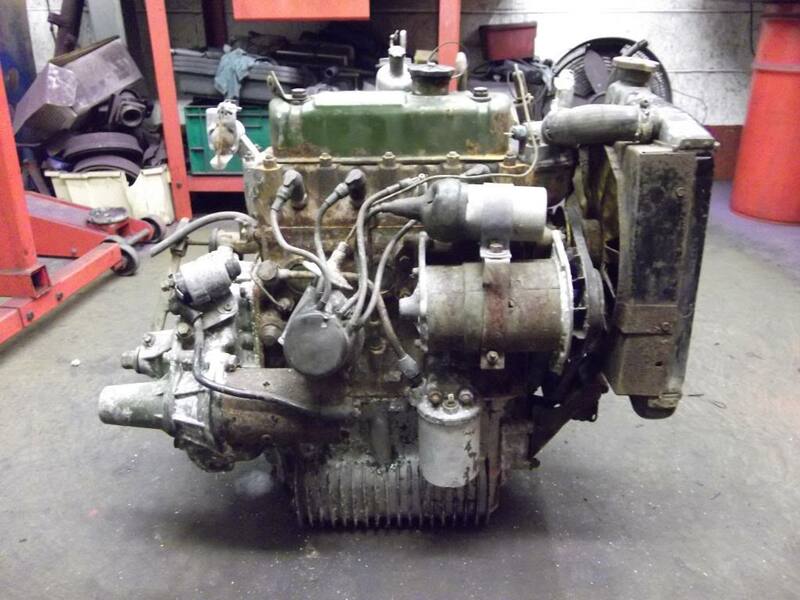 Within a few days on Ebay, came my ideal candidate, a low mileage (34,000) '65 Elf engine that had been pulled from a crashed car in 1970! The Buy it now button was hit, and my van was on it's way to collect my new project! On inspection, it seemed foolish to try & start & run it; the water jacket was full of enough crud to block a radiator, so I decided to pull it apart completely to see if it was anything like it's description! I intend to photograph as much as I can as I go, and build the motor up ready for a swap in the spring, and keep a record on here of it all. I hope you can all contribute where needed, and don't laugh too much at my misfortune....! Looks like a 998 engine. Would love to know what you paid for it ! Am facing a similar task here in Dublin - with a '66 Hornet 998 A-Series. However, don't know how many miles its done and I don't have the engine in my possession yet (its complicated). Will gladly compare notes with you when I get the engine dismantled - don't know what I'll find as its been out of action since 1990. Re: GONK ~ Re-Commission required! I'm not too proud to tell you. It was £300. I wanted to get the right engine for the car, and my window of opportunity to get it rebuilt is narrow, as it's getting to my busy time at work now. I don't have any idea if that's a good price or not. It does give me the luxury of keeping the car in one piece for the moment, so I suppose you have to factor more than the purchase price into the equation some times! I hope yours turns out to be what you need too! 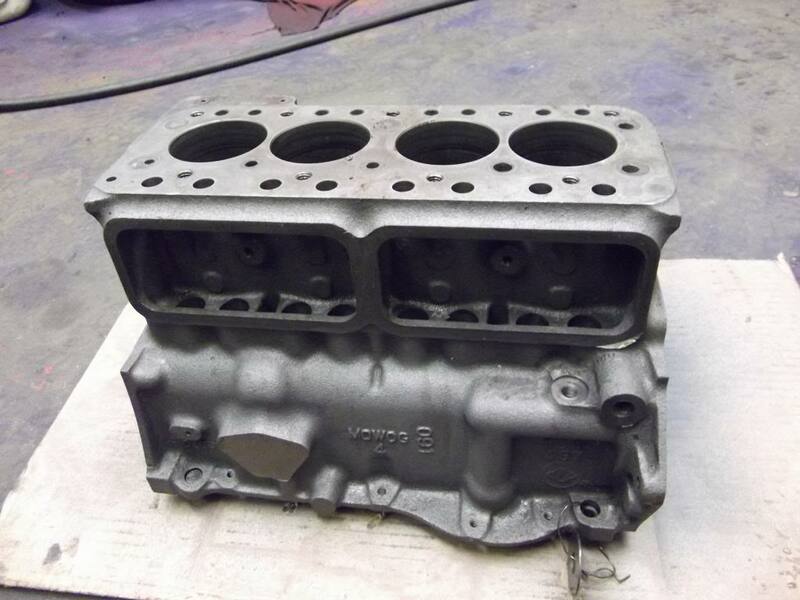 Block & crank have been picked up my the machine shop who already have the head. 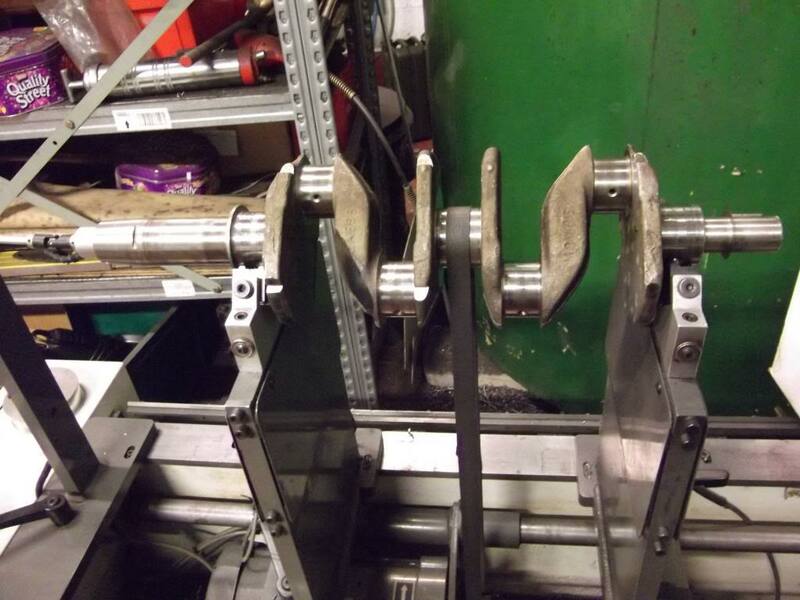 We then have a conflab as to whether we fit new pistons & bore the block. #1 piston is scuffed; it is the only damage on the engine. I reckon it probably did it on initial start up, and has been like it for it's entire life. I'm debating whether to fettle it up, or replace the set, in which case I'll bore the block for good measure. Engine has never been apart before, and is mint, bearings can go back in, crank needs a light polish only. Timing set is like a bow string, I'm really happy with what I bought here. 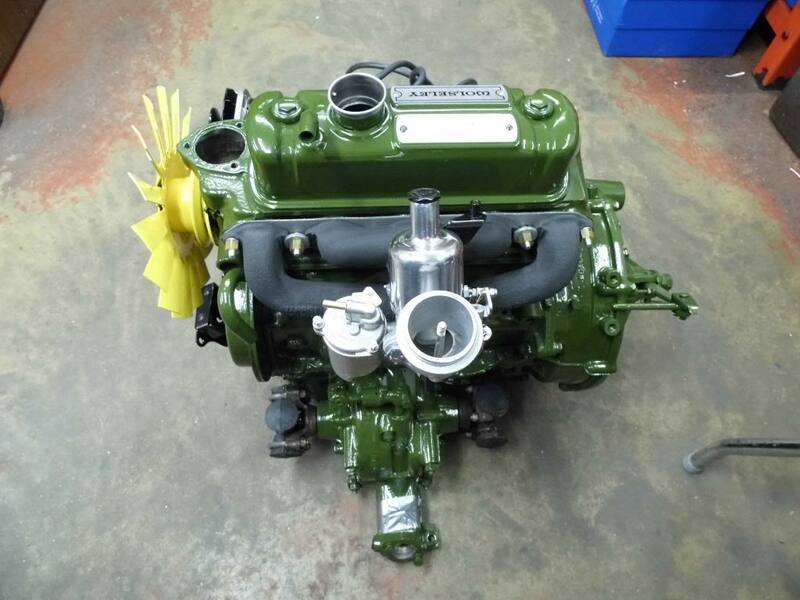 I've sent the carb to SU to be rebuilt as new; I think it's a lengthy process, so it went a couple of weeks ago. 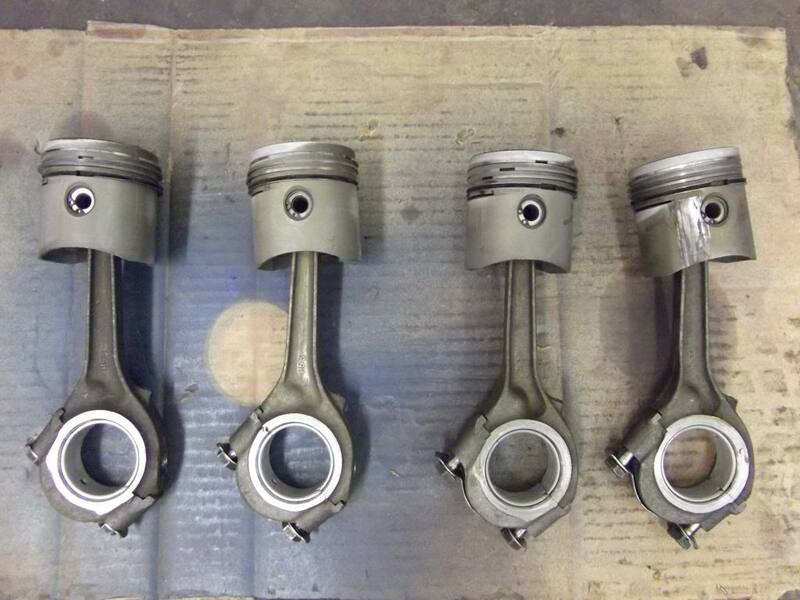 Picture of Pistons / rods / bearings. Much gnashing of teeth......new pistons & re-bore, or try to clean it up....? You certainly appear to have got lucky with this (is it a 998 ?) engine. I will follow its progress via your posts with great interest. 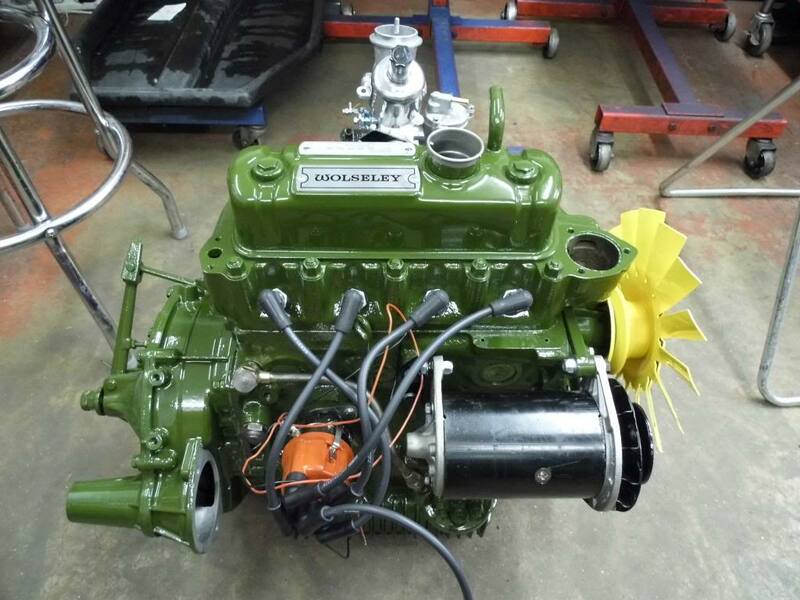 twin 1.25" SUs rebuilt/restored to " alleged good as new " condition. our respective bills (via PM if you like ) when your engine is all finished. sorry business again. 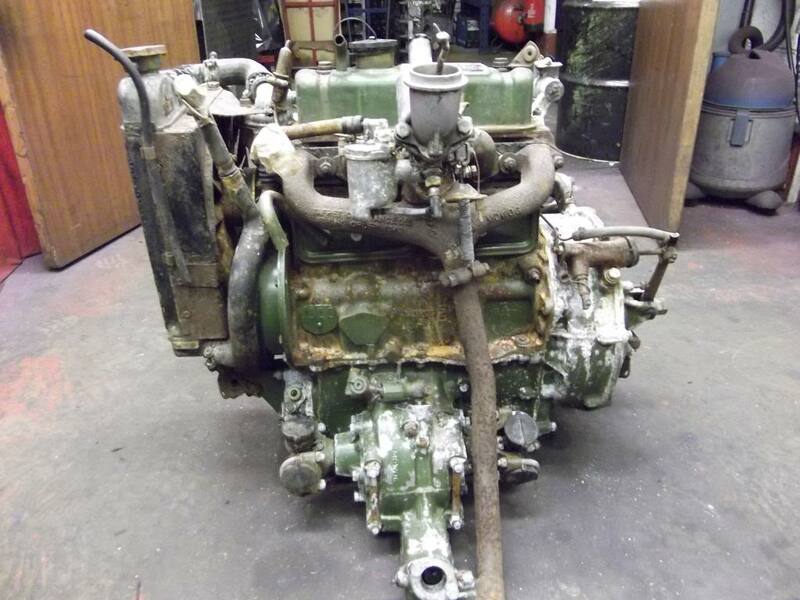 Needless to say - this engine/gearbox is being consigned to a different engine shop- so second time lucky ? can recommend your SU people to me ? It is a 998, and I'm doing it to basically standard spec. 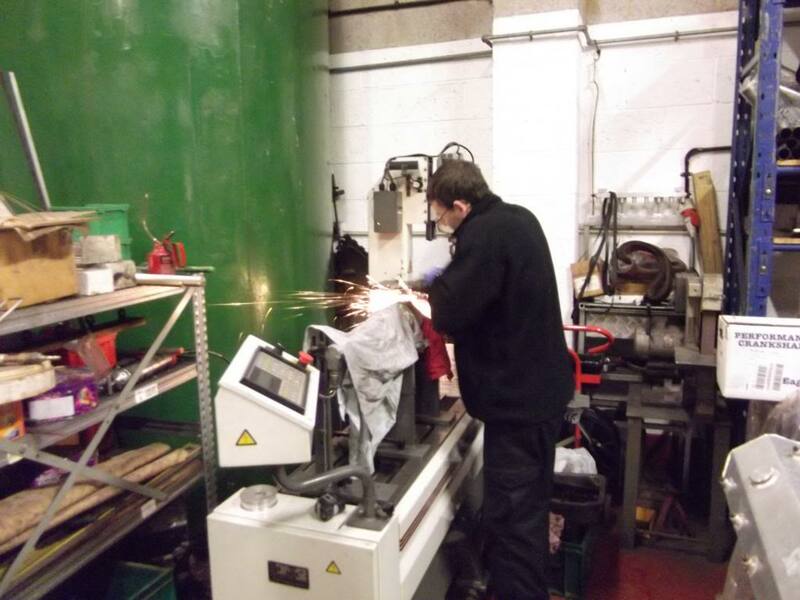 ..I'm using Knight Engine Services at Weedon (01327 340900) for all the machine work, because we use them a lot for engine machine work, and they are pretty good at what they do. I'll post pictures of what comes back. Surface Processing in Dudley (01384 242010) acid stripped the block, that was £90 inc vat, which isn't cheap, but it is the only process I've found that totally strips back to good iron. It's the same process that's used on bodyshells. Carb wise, I'm using SU in the UK, as they made it, and I'm hoping they can put it back to new condition, I'm not sure on the cost. 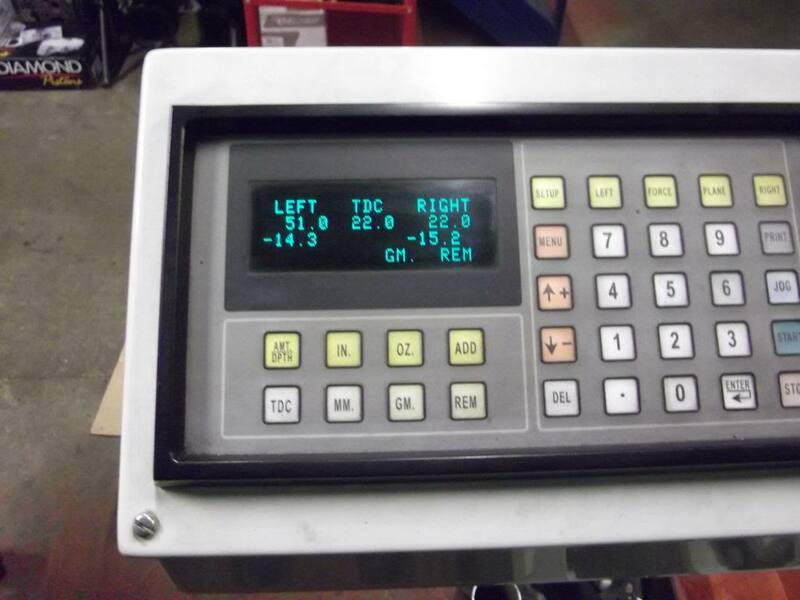 I guess you are running a tuned engine if you are using a 1 1/2 " SU? What parts are you putting in your motor? Uprated cam etc? My 998 Hornet engine - recently acquired - but not yet in my possession - is from the same car - i.e. a 1966 Dublin built Hornet. As its got a single SU carb on it - I assumed that carb to be 1.5" - I believed that to be he nomal size fitted to the 998 engine. From what you say - 1.25" single SU would be normally fitted - so that's what its got then. You might be right, could be 1 1/2, I didn't take much notice to be honest! I'm pretty much of the same opinion, I'd also like the engine to be standard. From how it looks, I can re-use most of it. I'll take the engine apart that comes out of the car when I do the swap, that one's done 57000 only, but has oil pressure problems & oil simply flows out of it at an alarming rate! I'll read your engine post fully when I get a few minutes. Funny how time flies by..! Finally got round to doing some more, so this week, the block, head, crank & new bits have arrived, ready to be assembled. Everything has been cleaned within an inch of it's life tonight, and work has begun. 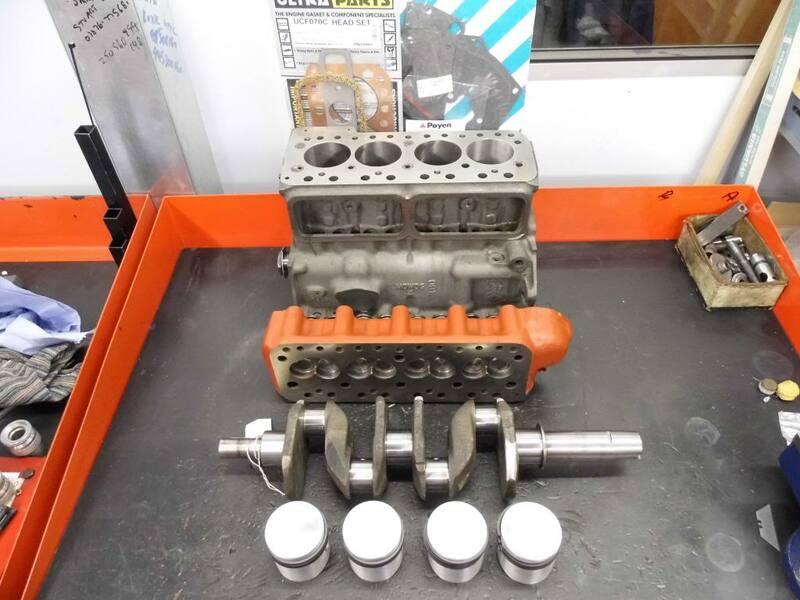 The block has been acid dipped; one of the pistons showed signs of scuffing & that bore wouldn't clean up with a light hone, so it was bored + 020" & honed. 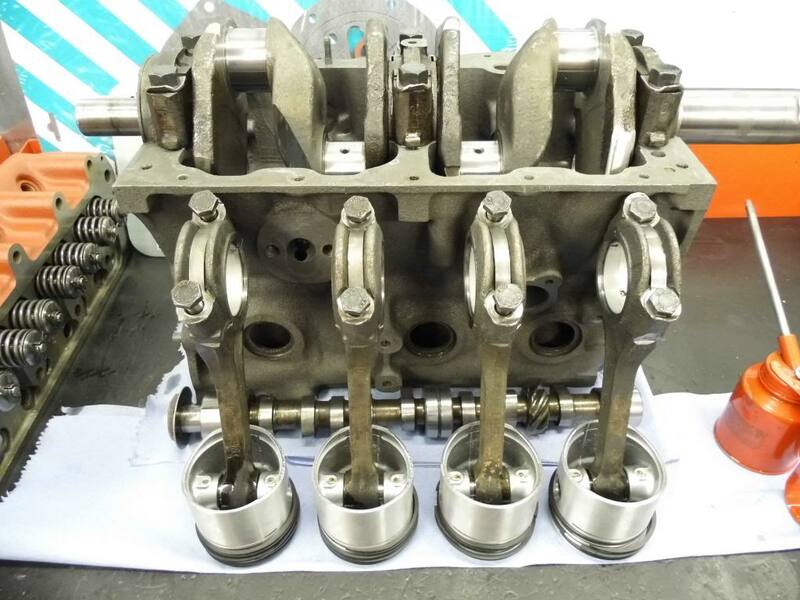 New pistons have been put on the rods tonight, and the crank, which remains @ STD, has had a light polish only. The crank has been torqued into the block. Spins lovely. The head has had new guides, unleaded conversion & new exhaust valves, and has had the decks trued. I now need to get a ring compressor small enough to put it together! Anyone know where I can get the right BMC Green paint in Aerosol form...?? Red Riley wrote: This what you need? That's the stuff! Many Thanks!! Now then, where were we again.....? Engine is back together & painted; just waiting for a few more bits from Mini Spares, and we're going to run the new engine up on a pallet with all it's life support systems attached before it goes in the car. The car has had the carpets pulled up and....well it's got some corrosion issues. The front bulkhead, drivers side needs some welding, and the bottom of the passenger side rear door bin had 1/2 " missing from it , so it's had to go, and the floor there has been holding water. Also found the car full of water when left outside, as it appears that the windscreen leaks now it's been in & out! May try to remember videoing the first fire up of the engine on the pallet & post it on You Tube. Cheers for now. Pete. GONK ~ WELL & TRULY RECOMMMISSIONED ! Paint manifold with Halfords high temp flat black paint. After a bit of coaxing to get oil pressure up, the old girl fired up immediately the ignition was connected, see the video of the engine running on the floor. Since my last update, I have come to the conclusion that the engine is now better than the car; this has lead to the inevitable conclusion that the car is going to need a full & proper restoration. Further investigation has shown that the car is full of plates, and since it's original restoration, problems have not really been dealt with in the correct manor. 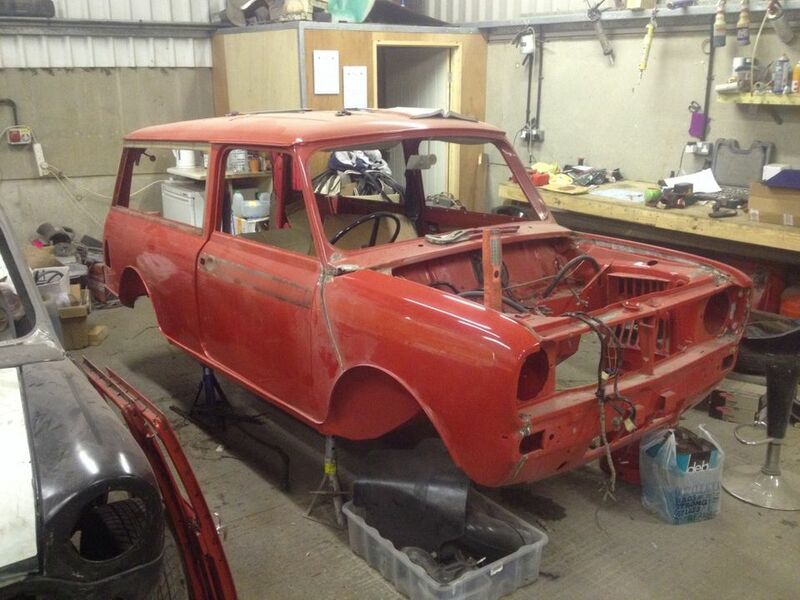 It is now being stripped to a bare shell to have all the floors cut out and replaced, together with a complete new front end, door skins etc. I'll upload some pictures once the old girl is stripped bare! That engine looks really good! Sounds good too! Good decision to redo the body. Car is being stripped to a bare shell, new floors, front end, door skins etc. Subframes off & blasted / painted. Then a new interior. Have managed to get hold of some good chromework to re-chrome. 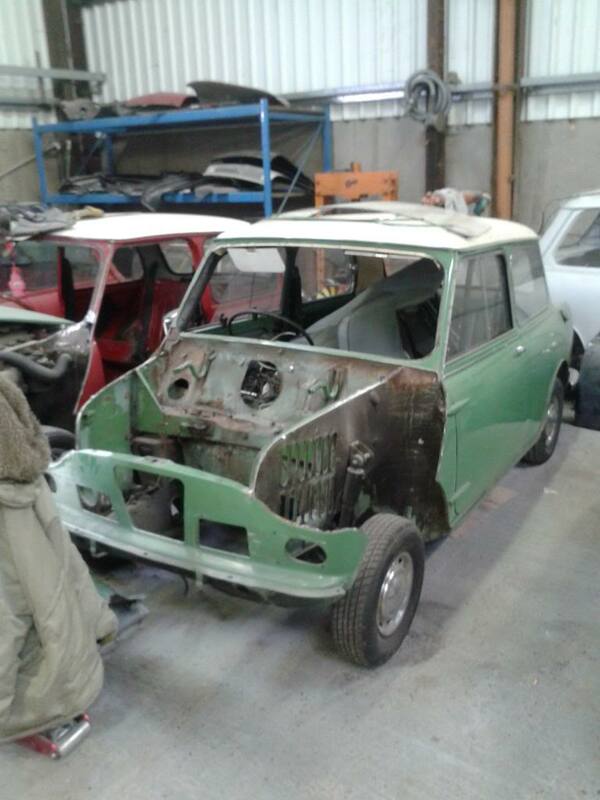 Original colour was Island Green with a white roof & grey interior. May go for a colour change, but it'll be a geniune combination. While we're at it; Clubman estate! This was already restored when I got it, just wanted finishing. Anyway, that all changed when we started poking Underside & floors are mint, it has 48000 miles from new. It looks like the previous owner started it right, then gave up. Bottom half of the car is great; underside & engine / bay all mint, fully detailed & painted. The rest, thrown together. Might be worth something one day !!!! » I'll be out of commission for a while!